Totnes has excellent road and rail links making it an ideal choice as a holiday destination or base for work. Totnes is easy to reach by rail, 3 hours direct from London Paddington on the mainline to Penzance. From the Midlands, the North, Scotland and Wales, services run through Bristol. The station is about a 10 minute walk into the town centre. National Rail Enquiries 0845 748 4950 nationalrail.co.uk. South Devon Railway is a heritage line running from Totnes to Buckfastleigh. 01364 664370 southdevonrailway.co.uk. 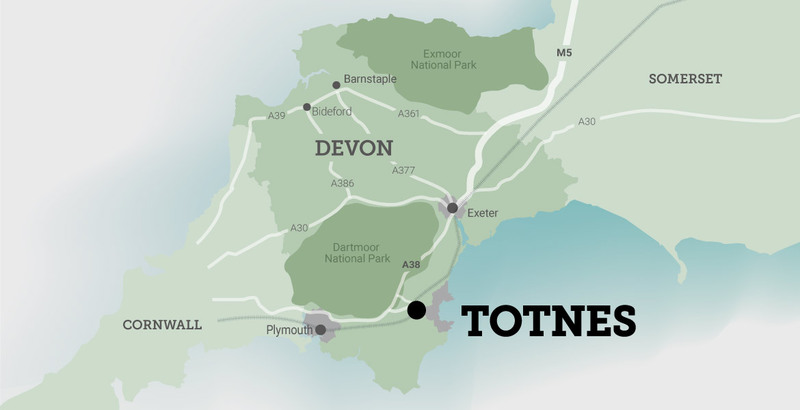 Totnes is about 5 miles off the main A38 Devon Expressway, midway between Exeter and Plymouth. From Exeter direction, take the A384. From Plymouth direction take the A385. The A38 is linked to the M5 at Exeter and the M4 at Bristol. Totnes has good road links to other towns and villages in South Devon. Totnes is served by National Express and has local bus links with most towns and villages. Coach services run from Heathrow and London Victoria and stop on Coronation Road in the centre of Totnes. National Express 0871 781 8181 nationalexpress.com. Traveline for bus and any travel information. 0871 200 2233 traveline.info.